UPDATE: Arcam offers free home trial on lower-priced rCube dock system | What Hi-Fi? Update: Having repositioned its rCube iPod dock with a £150 price reduction a couple of weeks back, Arcam is now offering a free 'try before you buy' scheme through around 100 home trial centres. You can get a loan of a flight case containing an rCube, plus the rWand and rWave wireless adapters to try out at home – for your nearest home trial centre, click here. Posted 07.09.11: Arcam is 'repositioning' its Award-winning rCube iPod dock with a permanent price cut of £150, and has upgraded the performance with its latest firmware 1.0.31 upgrade. 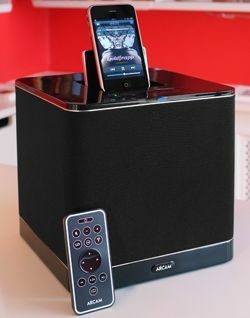 Our 2010 iPod Dock Product of the Year originally cost £500, but now it's yours for a more affordable £350. Arcam managing director Charlie Brennan says: "We intend to take the lion's share of the high-end dock market this season, and have decided to get very aggressive to achieve that. "The new rCube at £350 makes quality competitors look way overpriced and price competitive models decidedly under par. "Even better, the improvements we have made to the product are available to all existing owners for free." Arcam's latest firmware upgrade for the product – 1.3.01 – is said to give better overall sound, allow the rCube to play louder, improve bass performance and extend standby battery life. In addition it gives faster switching of bass mode, improves latency – useful when several rCubes are used in various rooms – and gives better support for older iPod models. All rCubes currently shipping and in stores include the firmware update. Existing rCube owners can get the upgrade carried out at their local Arcam dealer for free. Alternatively, they can download the update from Arcam's website, burn it to a USB stick and carry out the upgrade themselves. To check which version of the software your rCube is running, insert an iPod or iPhone, navigate on the menu to settings > about > rCube and you'll see the details displayed. You can watch our video review of the Arcam rCube here.